--> Aditi Arya was declared fbb Femina Miss India World 2015 at a star-studded event at the Yash Raj Studios, Mumbai on 28th March 2015. --> Afreen Racheal Vaz was adjudged first runner-up while Vartika Singh second runner up at the grand finale of 52nd year of fbb Femina Miss India. --> Aditi will represent the country at Miss World pageant 2015. --> The event was judged by eminent personalities from the industry like John Abraham, Manisha Koirala, Sonu Nigam, Anil Kapoor, Firoz Nadiadwala, Abu Jani & Sandeep Khosla, Shilpa Shetty, Sonali Bendre, Shiamak Davar and Chitrangada Singh. --> Internationally acclaimed filmmaker Adoor Gopalakrishnan was on 29 March 2015 presented with the Bishwaratna Dr Bhupen Hazarika International Solidarity Award by Assam Chief Minister Tarun Gogoi in Guwahati. --> Gopalakrishnan became the second recipient of this biennial award, the first one being Lubna Marium of Bangladesh in 2013. --> The award carries a citation, a shawl, a memento and Rs 5 lakh. --> The award was instituted by the Asam Sahitya Sabha and sponsored by the Numaligarh Refinery Limited (NRL). --> Saina Nehwal has lifted the women's singles crown of the India Open Super Series Badminton tournament while Kidambi Srikanth won the men's singles title at the India Open Super Series on 29 March 2015. --> Saina defeated Ratchanok Intanon of Thailand in straight games 21-16, 21-14. --> K Srikant beat Denmark's Viktor Axelsen 18-21, 21-13, 21-12 to win his maiden India Open Super Series. --> The event was held at Siri Fort Indoor Complex in New Delhi. 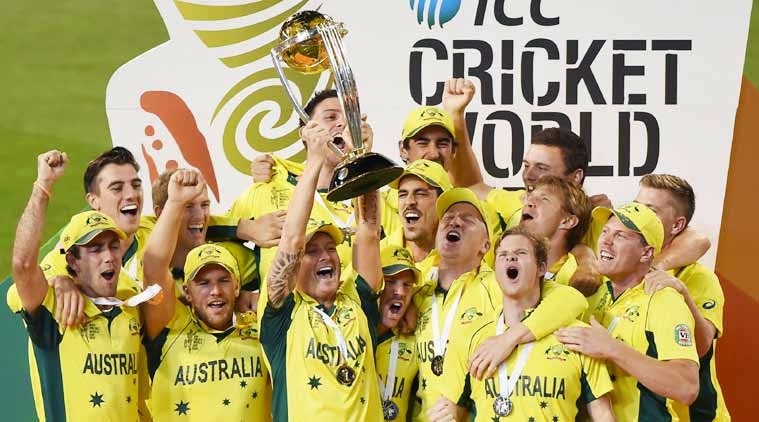 --> Australia won the ICC Cricket World Cup 2015 for the record fifth time on 29 March 2015 by defeating New Zealand by 7 wickets. --> The final was played at iconic Melbourne Cricket Ground (MCG), Australia. --> New Zealand had won the toss and had chosen to bat first and had set the target of 183 runs to Australia after losing all wickets in the 45th over. --> Australia rarely looked troubled, sealing a seven-wicket win in 33.1 overs, with captain Michael Clarke scoring 74 and Steve Smith 56 not out. * Man of the Tournament: Mitchell Starc (Australia) - 22 wickets in the tournament. --> Bhartiya Janta Party (BJP) has emerged as the largest party in the world with a membership of 8.8 crore on 29 March 2015. --> The BJP has surpassed the Communist Party of China that has a strength of 8.6 crore members. --> Online Membership drive which was launched by the Prime Minister Narendra Modi in November last year has marked 8.80 crore membership of BJP and expects to cross 10 crore by the end of March 2015. --> Michael Clarke, the Australian cricketer, on 29 March 2015 retired from One Day Internationals (ODI) after final match of 2015 Cricket World Cup. --> He will continue to represent Australian cricket team in the Test matches. --> He has 7981 runs to his credit in ODIs from 245 matches, of which 130 was his highest score. --> Ferrari driver Sebastian Vettel won the Malaysian Grand Prix on 29 March 2015 to end Mercedes’ long Formula One winning streak. --> Lewis Hamilton finished second while Nico Rosberg finished third. --> It was Ferrari’s first victory since the 2013 Spanish Grand Prix. --> Prime Minister Narendra Modi on 29 March 2015 lauded Singapore’s founder and first premier Lee Kuan Yew as a “global thinker”, and said India deeply valued his friendship and his support for its economic progress. --> Modi, who arrived in the morning to attend the State Funeral Services of Lee, described the former Singapore PM as “among the tallest leaders of our times”. --> 91-year-old Lee died of severe pneumonia on March 23.